If you want to install a web server, or an application which requires web pages or console to be served via common HTTP or HTTPS ports, i.e. port 80 and port 443, there may be error message that saying the port 80 or 443 has been in used or occupied by another application. However, no web server such as Apache or IIS (Microsoft Internet Information Service) is currently installed or running on the system. If you investigates to the root by identifying which application is using the port 80, the cause of the problem is due to Skype. Skype allows users to use port 80 and 443 as an alternatives for incoming connections. Skype uses port 80 and 443 to allow Skype behind firewall to connect to peer or accept incoming connection from peers though NAT which otherwise won’t be able to connect through the blocking or restrictive firewall that doesn’t permit any other ports to be opened. Skype which is listening, opening and occupying port 80 and port 443 (for SSL HTTP connection) can prevent other applications which require such port from working properly, as such the ability of Skype to use port 80 and port 443 has to be stopped, turned off and disabled. Beside, leaving the port 80 and 443 opens and listening also has security risk where the port can be scanned by malicious virus or hacker to launch attack or infection. 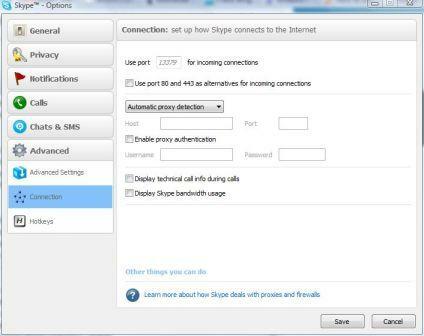 To turn off and disable Skype usage of and listening on port 80 and port 443, open the Skype window, then click on Tools menu and select Options. Click on Advanced tab, and go to Connection sub-tab. Untick or uncheck the check box for Use port 80 and 443 as an alternatives for incoming connections option. Click on Save button and then restart Skype to make the change effective.